Rejoice! The Stapleton Staple Hill Tunnel Railway Path closure "6-10 weeks" is due to be complete next month. That's five seven months after it began. This is good news for cyclists as it means they don't have to suffer cycling through parts of the city that are so unused to cyclists they have to have warning signs up, parts of the city where locals put tacks out in their way. As for the locals —the S Gloucs Electorate— they can stop being held up by cyclists, park their crossover SUV on the pavement outside their house, sit in front of the TV and go read Bristol Evening Post about how an anti-car city is at war with them. These things actually make the Tunnel closure seem like well thought out. It was scheduled over winter, there were signs from the outset, and eventually the council came up with a route that worked: no main roads, no mad residents, low stress. Ten Weeks, goal being to widen the path on one of the busiest stretches of the route. This will be good for walkers and cyclists, though there's one question: why wait for spring, so closing this stretch until June? As the BCyC note, the cyclists actually had to push to S Gloucs council to postpone the roadworks until after the whitsun bank holiday. That's the most popular cycle route in the country, and a council proposing to close it over the first weekend of the school half term. Even closing it for the rest of the week is bad enough. Apparently S Gloucs council say "Alternative routes will be posted whilst maintenance work is carried out between Bitton & Saltford"
The fact that they have to promise this shows how little thought goes into the work. Imagine the M4 was being shut for repairs. Would they come up with a plan to deal with the traffic volume, or would they have a couple of arrows pointing you to somewhere (The A4? A431? Something that beanders through the back roads which will takes ages but will ensure you rejoin the path alive unless some S Gloucs chav who likes doing country roads at speeds comes round the corner too fast and "loses control". Then, after killing the family, they'll try the "there was nothing I could do gambit" and get off with a light tut-tut from a jury. No attempt will be made to provide a safe alternative route, if that route impact the traffic flow of motor vehicles in the area. you can see that even in Bristol centre: you can get across via staggered toucans —but have they increased the cycle times of the lights to let the cycle traffic through? If they have, it's not working. 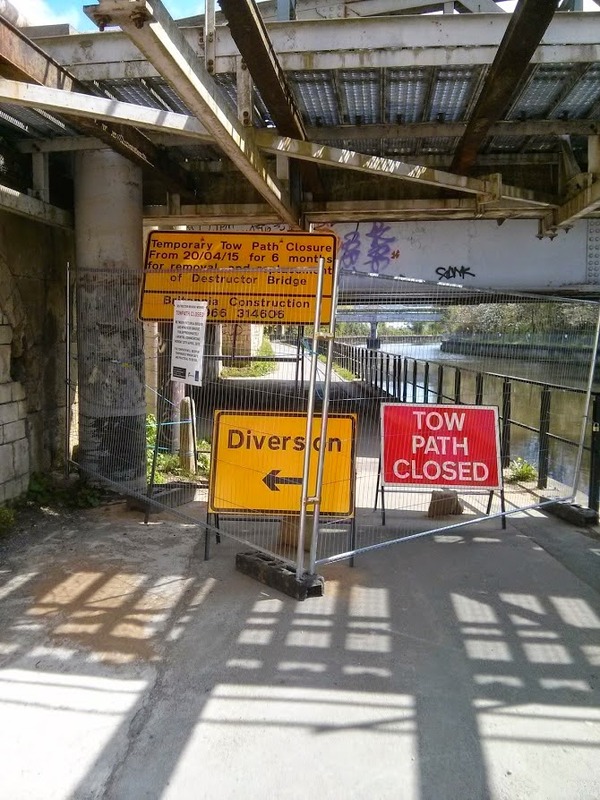 This is a "temporary" closure of six months of the river path joining up the railway path with the centre of bath. Which a pretty lose definition of "temporary". And where do they take you on this closure? BANES council can't even be arsed to lay down a strip of gravel to ensure that any cyclist diverted to the Bristol Road doesn't get a puncture en-route to fighting for space with buses and tipper trucks. Furthermore: why hasn't it had tarmac already? Does someone want to preserve the "rural"nature of a link to a river from a main road which oozes diesel pollution? Were it not for the fact that it'd close the exit for twelve weeks for resurfacing, it'd be worthwhile complaining about this. What do all these roadworks have in common. They abandon you on alternative routes. No attempt is made to make these alternative routes safe to cycle on. At best you get yellow signs showing you where to cycle. 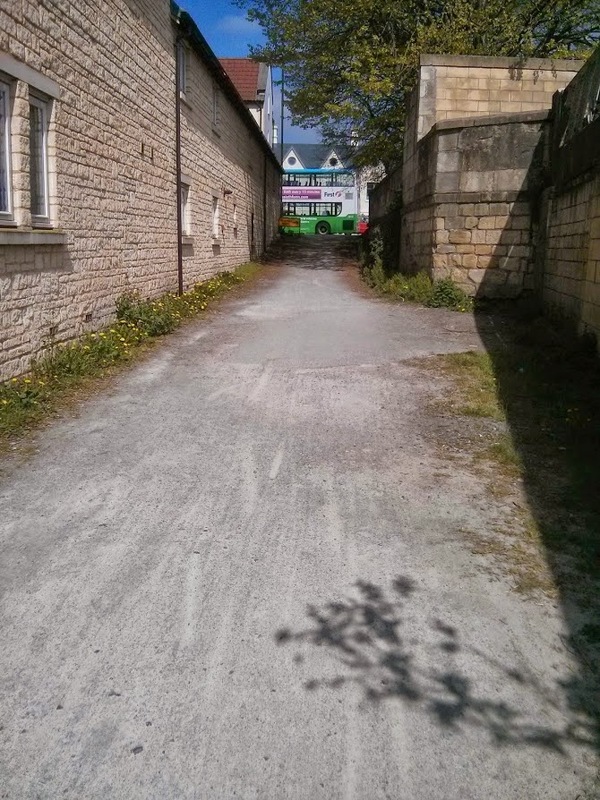 At worse (Bath), you are left with some random diversion signs on the way in to town -and nothing on the way back. All but the tunnel have been scheduled over the summer. If there is a fundamental problem here it is: the BBRP is the only way to get between Bristol and Bath that people on bicycles actually enjoy. It's family friendly, its flat, and nobody fears for their lives. Whenever its closed, then, the councils dump you on the mediocre unpleasantness that lurks alongside the path. The presence of the path has allowed the councils to avoid making any infrastructure improvements in parallel. The growing popularity of the path is forcing them to take action, but it's signs and PCSOs telling cyclists to slow down, rather than providing alternative routes. 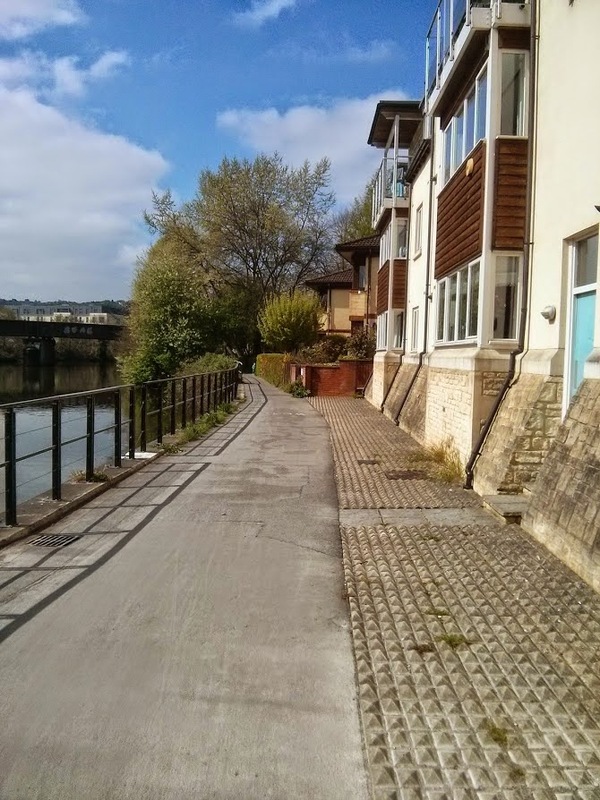 Why doesn't the A4 Upper Bristol Road into Bath have cycle facilities? Because it's been possible to push the cyclists out the way into a slow-motion conflict with pedestrians. Why will the Bitton-Saltford detour —inevitably— involve one or more of : random back roads with inadequate signage, cyclists-dismount signs, points where you have to pedal for your life across the A4 or along the A431? It's because the councils don't care. IF S Gloucs council cared about cycling as transport, they'd have more to spend their money on than resurfacing the one path in the region people use, and if they were to do the resurfacing (to be fair, the surface is bad), they'd do it over winter, and/or make sure the path was open on weekends. As for BANES, they almost make S Gloucs look good. They still look better than North Somerset, but N Somerset are the rural equivalent of Westminster City Council, so that's not saying much. Their sole contribution to cycling is the fact that most one-way streets in the core have formal cyclist contraflows -not that van drivers on phones recognise or accept that. There's nothing to stop them painting bicycle signs on their road for the six months, or to put signs up on the A4 warning drivers of lots of bicycles ahead. But they don't, because they don't care or caren't be arsed. The Lawrence Hill diversion is rather nasty, but I'm glad to now know that some actual improvements will come from it. Oh, and it's Staple Hill tunnel, btw - not Stapleton.